Designed to simulate a patient’s neck. The Neck Phantom is designed to simulate a patient's neck. The phantom is constructed of lucite. 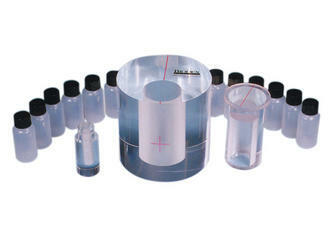 It has a two part insert that allows counting from a bottle, vial or capsule. A capsule holder is supplied to enable the user to count capsules directly, without having to dissolve them. The phantom's cylinder and carrier have scribelines for accurate alignment. A flat surface on the cylinder allows either vertical or horizontal positioning. Twelve 30 ml bottles are included with the phantom. Proposed by the International Atomic Energy Agency (I.A.E.A.) and the American National Standards Institute.